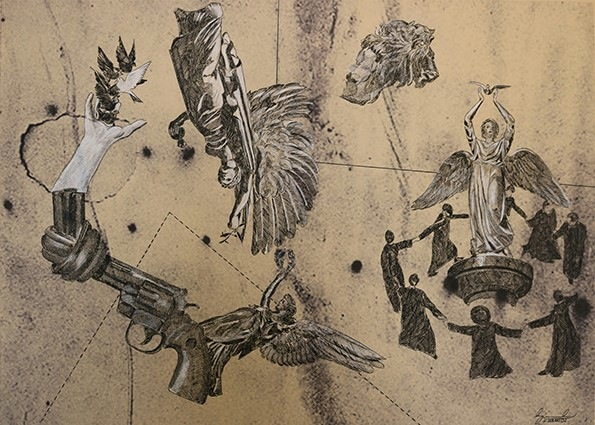 At the bottom of the image, an angel is at the back of a handgun; the gun's barrel is twisted and a hand outstretches from it with birds and a single dove. At the top, an image of an angel is overturned. To the left, are depictions of a lion and of black-clad humans interlinked and circling a statue of an angel holding a dove in its arms. 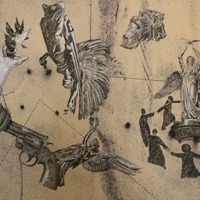 Hoseyn Hamidi, “untitled,” Peace Posters Dialogue Project, accessed April 23, 2019, http://peaceposters.oberlincollegelibrary.org/items/show/358.